There's a nice article about heraldic mottoes from August 25, 2012, over the on the website of Canada's National Post entitled "Words to live by (or at least to have translated into Latin)" by Jane Macdougall. 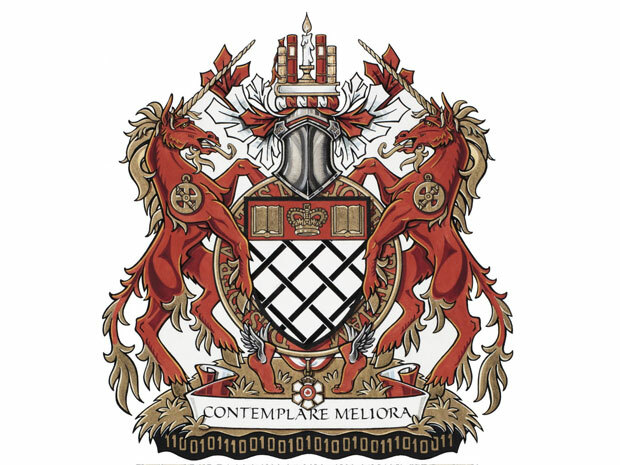 Included with the article is a rendition of the arms of Governor-General David Johnston along with his motto, Contemplare meliora, or "To envisage a better world." Oh, and the title of this post? It's a short version of my own motto, which in full is: Ex fructibus eorum cognoscetis eos, roughly, By their fruits shall you know them. It's a play off my surname (Appleton), as well as the three apples on the coat of arms and apple tree for a crest. That's one of the fun things about being a herald of sorts, you get to play around with your own heraldry and getting all of the pieces to work together. The binary code at the bottom of that Governor-General Coat of Arms is interesting too. Indeed! 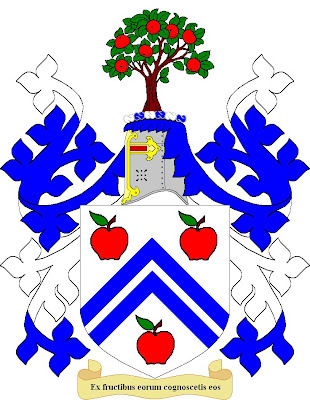 Although, as I noted back in this post, http://blog.appletonstudios.com/2010/10/heraldry-in-news.html, there actually is no meaning behind the ones and zeroes of the binary code there. You may change your mind about the binary after taking 11 minutes to view this video I made. It demonstrates features that strongly suggest that they are not random digits. I suggest watching in full screen or the highest quality because some of the digits are small. Thank you. This is a wonderful site. We have similar interpretations of heraldic symbols and themes. I made a video a few weeks ago showing some strange things about the Governor General's Coat of Arms and the binary on it. Today, I noticed something kinda cool and thought I would share. Take a close look at that number. What do you notice about it? Split it down the middle and you have 68307 70643. The first digit is double the value of the last digit. The second digit is double the second last digit. The third digit is half of the third to last digit. And the middle ones are even or neutral. But actually you can create something else with it using the values. 221000211. See how that works. You may be asking why that is significant. Bare with me. I know 99% are rolling their eyes. 100011101000111 as HEX is 4747, which converts to "GG". Initials of Governor General. GG.ca is his website. When you convert to base 33 (there are 33 digits in the original code) you get "GOV"
There is a lot more to it. I'll continue to show some strange coincidences if anyone is interested. Sorry if I am not explaining this correctly. By now you have probably figured out that I have no background in this. Which is why I am here.